No two slabs of granite are the same. Each has a unique pattern like a fingerprint which is not similar to any other. So be prepared to get confused and overwhelmed as you enter the warehouse. However, if you keep these 4 simple tricks in your mind, you can quickly narrow down on a granite design and colour that best suits your kitchen. This is what will make or break the design of your kitchen. A lot of people have the misconception that granite is available in just a couple of colours. The fact is that granite countertops are available in colours like blue, red, green, golden, pink, silver, white, black and grey. That’s not all. The hallmark of a quality granite stone is the deep veins and patterns that give it the unique look that is so renowned. Most experts recommend that your choice of granite colour should depend on your end goals. If your idea is to keep it modern and contemporary, then you can choose a granite colour that matches your countertops and cabinets. On the other hand, if you wish to go classical, then choose a contrasting colour to create visual interest in the kitchen. 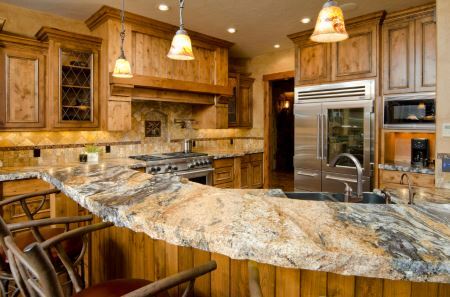 Granite countertops are available in two different thickness. The thinner one is 3/4th inches thick whereas the thicker slab is 1 ¼ inches in thickness. Your choice should depend on the area where you intend to use it and the intended use. Thinner slabs need support for the overhang and hence can only be used in areas of the home where the necessary support can be installed. Thicker slabs on the other hand do not require support and hence, you can find a single uncut slab that goes on for a longer distance as compared to the thinner one. Both varieties can be used in kitchens and bathrooms of your Toronto home. Edging is a process that creates visual interest because it is the most visible part of the granite countertop. While most manufacturers may offer a couple of standard edges, there are an abundance of designs to choose from. Bevel, bullnose, full bullnose, demi bullnose, reverse bevel, double bullnose, rounded, square, ogee, rockpitch, waterfall and DuPont are just some of the edging options. Take your time to choose an edge that blends with the overall theme of the kitchen. Modern kitchen designs prefer granite with clean lines and hence a straight edge may work better. Last but not the least, the type of granite counter will also be determined by the type of sink in your kitchen. Undermounted sinks allow you to choose a single seamless slab of granite. If you have a drop-in sink, then you will have to select a different design. Speak to your granite fabricator to get more ideas about the various options you have while selecting a granite countertop for your Toronto kitchen.